The client is associated with one of the leading and industrious airport authorities. Having to deal with control and management activities 24*7, airports are one of the complex places to maintain. Usually, queue management is crucial at airports. Understanding the flow of passengers, managing of passenger terminals, and provision of check-in to security is generally complicated at the airport. SPEC INDIA is known for its dedication towards building most-usable and innovative software products. To help airport authorities in the better management of people, SPEC INDIA built beacon app which can connect people, places, and things. Passengers can receive information such as boarding time and gate number etc. It provides up-to-date and relevant information to passengers on their mobile devices such as directions to various locations including the gate, nearby restaurants, ATMs, restrooms etc. For instance, when passengers enter the baggage hall, the phone can display which carousel their bags will arrive on, and how long it will take before bags arrive. By adding Beacon infrastructures at the airport, you will be able to watch over the accurate and real-time information about a number of passengers in each area. The cloud-based platform can record passenger’s time and location that includes details about specific airport services like business lounges, relaxation rooms, smoking areas and so on. By gathering information about customers’ interests, destinations, and behavior, the airport can take advantage of the commercial relationships and expand the business. 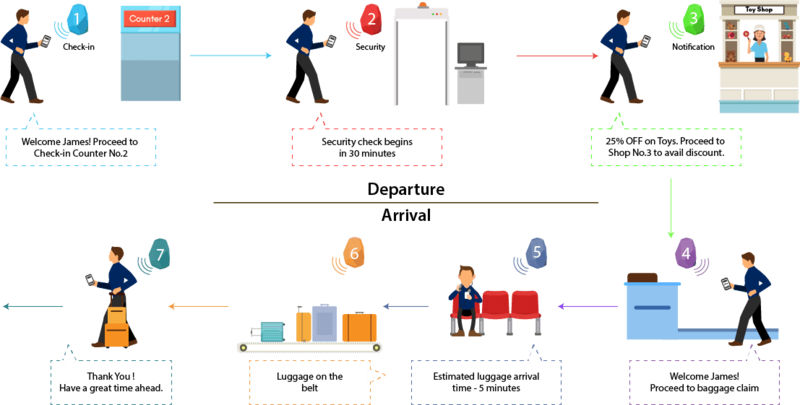 By tracking general movements of passengers across the airport, operators can clearly understand what their infrastructure needs. Analyzing data can lead to better layouts that provide better experiences for visitors. This means shorter wait times and well-organized facilities. Proximity-powered heat-mapping or data generation can clearly show the flow of passengers, chances of holdup and where management should make changes.